This page displays items priced at the “lot beer” standard of 1 for $3, and 2 for $5. 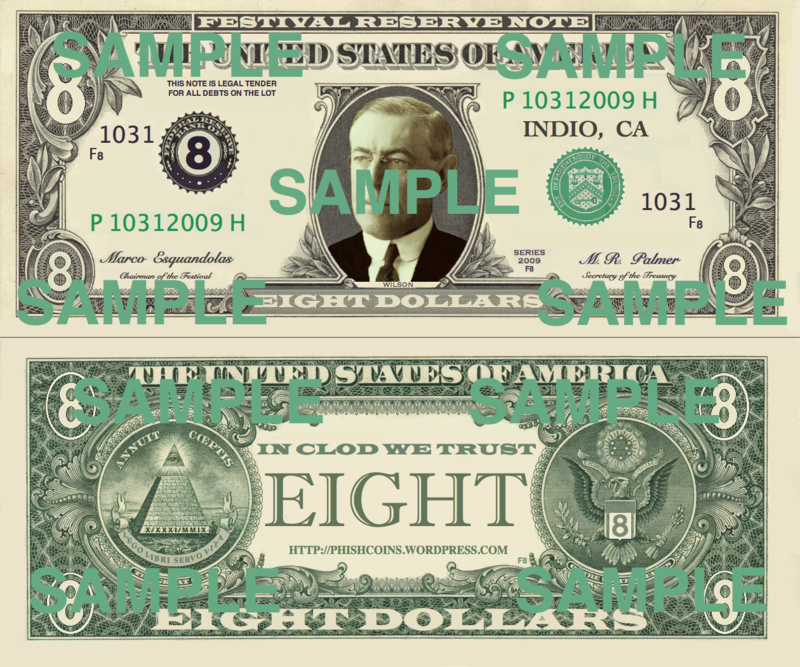 The idea to design an $8 Bill for Festival Eight actually came to me late night ON Halloween, so it is safe to say it was a little late! However, over the past few months, the idea kept popping into my head, so I decided to go for it. The design is based on the $1 Bill, and I tried to work in as much Phish symbolism as possible while remaining true to the original form. Basically anything that I could alter to make the Festival $8 Bill Phishy (in a subtle way) I did. The serial number references Halloween, as do the Roman numbers at the bottom of the pyramid. I took out 5 of the 13 stars, olive leaves and arrows in the seal on the right side of the back of the Bill to make eight of each as a nod to Festival 8. Taking out the middle 5 stars actually created an unintended figure eight, which I thought was extra cool! I also removed the center tail feather of the eagle to make it so there are only 8 of them. I changed the Latin slogan below the pyramid to say “Lego Libri Servo Vita” which means “Read the Book and Save Your Life,” and the signatures at the bottom of the front side of the Festival $8 Bill are those of Marco Esquandolas and M.R. Palmer! The Department of the Treasury seal has been altered to reference the Rolling Stones’ Exile on Main Street album cover choice for Halloween. 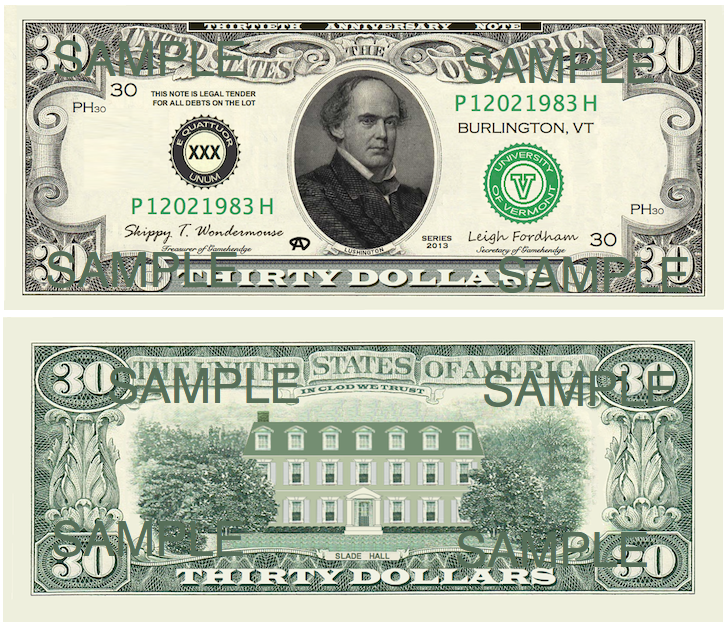 I originally wanted to use a visage of King Wilson, and then it hit me that Woodrow Wilson was on the now defunct $100,000 Bill, so it seemed like a nice touch. I also changed the letter in the middle of the Federal Reserve Seal to an 8, and the city of printing has been changed to Indio, CA. I changed the other serial numbers to F8 and 1030 and 1101 to represent the other two days of the festival. In Clod We Trust needs no explanation, does it? The Festival $8 Bills were printed on Crane & Company 100% Cotton woven paper… as close to the U.S. currency as I could get without having the Feds poking around! I have to admit that I was hoping after Festival 8 that Phish would use a #9 in the name of their next festival. They obviously did, so I present to you what will likely be my last attempt at a Phishy take on U.S. currency… The Super Ball $9 Bill! 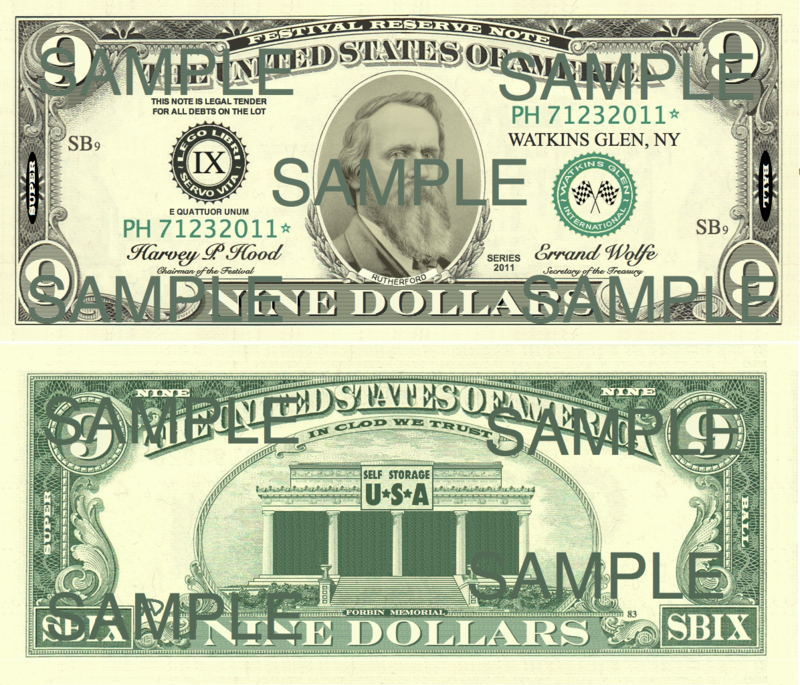 While I used the $1 Bill as the inspiration for the Festival $8 Bill, I settled on a vintage $5 Bill as the “template” for the Super Ball $9 Bill. As with the Festival $8 Bill, I tried to stay as true to the layout of the currency while littering as much Phish symbolism as possible into the design. Regarding the front side of the Super Ball $9 Bill, the serial numbers mark the dates of the festival. The “printing” city is Watkins Glen, NY. Rutherford B. Hayes (dead presidents only) symbolizes Rutherford the Brave. The Chairman of the Festival is Harvey P. Hood (who we know as Harry Hood) founder of the H.P. Hood Dairy Company. Errand Wolfe is the Secretary of the Treasury, as he would have been in charge of the finances of the Lizards after the death of Mr. Palmer and the overthrow of King Wilson. The black seal on the front side contains the Latin phrase “LEGO LIBRI SERVO VITA” which translates to “READ THE BOOK & SAVE YOUR LIFE” and the Roman number “IX” to represent Super Ball IX. Underneath this seal is the latin phrase “E QUATTUOR UNUM” which is a Phishy off-shoot of the phrase “E PLURIBUS UNUM” which appears on U.S. Currency. While “E PLURIBUS UNUM” means “FROM MANY… ONE” the phrase “E QUATTUOR UNUM” means “FROM FOUR… ONE” which to me is really what Phish is all about, the sum of all parts is greater than any single element. The green seal has checkered flags and reads “WATKINS GLEN INTERNATIONAL” where Super Ball IX was held. The Super Ball IX ‘Superball’ is a jumbo sized superball conceived to commemorate the Super Ball IX Festival in Watkins Glen, NY. The Super Ball IX “Superball” was designed with two things in mind: to mimic the color scheme incorporated into the logo advertising the festival, while capturing the patriotic vibe of Independence Day Weekend. My favorite Phish memorabilia are quirky items like the 1994 NYE Ping Pong Ball, the 1994 & 1995 Phish Halloween Chocolate Coins, and the 2010 NYE Hot Dog. My hope was to create a unique item in this vein, and this is what I came up with. The beauty of the Super Ball IX ‘Superball’ lies in its simplicity. There isn’t much to be said about it, as the picture tells the story. The Superball IX ‘Superball’ measures in at almost 2″ in diameter. Get one for everyone in your crew! The Buffalo Bill Wooden Nickel is based off of an idea I have had for awhile, but have been waiting for the right shows for one. When the Colorado Run was announced, it seemed perfectly fitting to design a Wooden Nickel for. Seeing as the traditional Wooden Nickel contained the image of a Buffalo in it, what better place than Colorado for a Buffalo inspired item! However, instead of having a Native American head on the flip side, it struck me that the Wooden Nickel should have the face of Buffalo Bill on it. 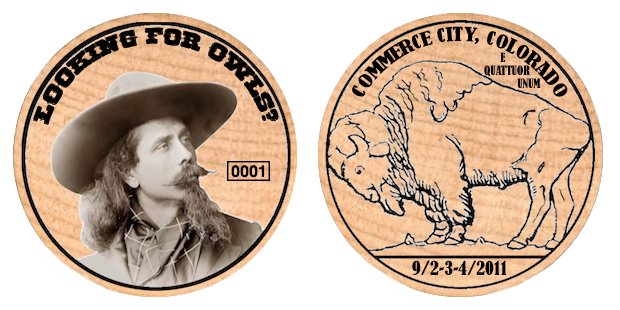 The Buffalo Bill Wooden Nickel commemorated the Colorado Run this upcoming Labor Day Weekend, while also paying homage to an elusive crowd favorite. I chose to depict Buffalo Bill as a young man with a pensive look on his face. This seemed to go perfectly with the opening line of the song “Looking for owls? The young man asked…” Buffalo Bill had strong ties to the Denver area, actually passing away there in 1917. For the flip side, I did my best to recreate the look of the classic Buffalo Nickel minted between the years of 1913 and 1938. The fact that most of the Buffalo Nickels produced were minted in the city of Denver just added to the appropriateness of the design. The buffalo has a “PH” ranch style brand logo on its rear hip area, as is customarily done on ranches to identify herds of cattle. Above the buffalo is the location of the Colorado Run, and below the buffalo are the dates of the shows. However, I came up with a Phishy spin for the “E Pluribus Unum” phrase which appears on all U.S. Coins and means “From many… one.” I changed this phrase to read “E Quattuor Unum” meaning “From four… one” which to me best represents what Phish is all about! The sum of the parts are greater than any single component… Isn’t that what makes them so special? The Buffalo Bill Wooden Nickel was printed on wooden nickels 1.5″ in diameter, just like the ones issued by the U.S. Government during the Great Depression. Wooden nickels would later become popular promotional items for events, so I decided to resurrect the idea for this special run, I hope you like it! 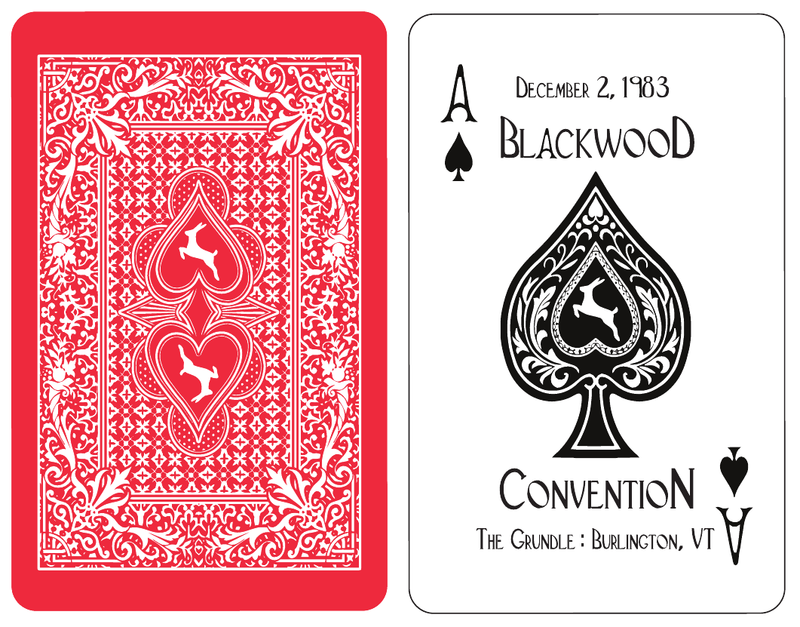 The Blackwood Convention Playing Card Commemorates the first Phish gig ever, before they were even Phish! Blackwood Convention is actually a strategy that teams can use when playing Bridge. For this reason, I felt that the best way to commemorate the first ever gig was to design an authentic Bridge playing card. This playing card is 1/4″ narrower than a standard Poker card, so it will fit perfectly in your wallet if you want to have it on hand at all times. You never know when an Ace of Spades could come in handy!